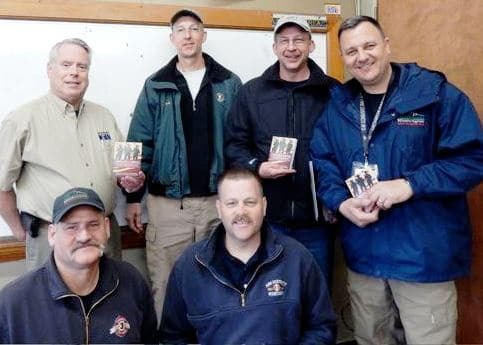 ARLINGTON, Wash.––Arlington United Church’s Men’s group distributed Strength for Service to God and Community daily devotional books to 200 first responders involved with the Oso, Wash., mudslide. The men were involved in the tedious process of identifying remains more than a week after a March 22 landslide roared across the North Fork of the Stillaguamish River and buried a community at Oso, about 55 miles north of Seattle. Books were delivered to first responders in Oso, Darrington, and Arlington. More than 800 first responders and National Guard units were involved in the operation. From left: Alan Lish of Arlington United Church presents Strength for Service books to Kevin Griffee of the Vancouver Fire Dept. ; Steve Westlake, Eastside Fire and Rescue in Issaquah and Brian Hyatt of the Monroe Fire Dept. Capt. Ron Adams, Monroe Fire Dept. ; and Steve Mason, Snohomish County Fire District kneel in front.